CIAO Famiglia! Come out and support our fellow CIAO members, the Guagentis at Milanos and Gina Chiappazzi, owner of Limaland Comedy! Three days of comedy in celebration of Phyllis Diller Day in Lima, Ohio. Lima, Ohio: In July of 2013, Limaland Comedy requested to the mayor and city council of Lima that July 17th should be forever known as Phyllis Diller Day. That request was granted. This year is the second annual Lima’s Funniest Lady Comedy Festival and it has increased to three days in just one year’s time. Each event is created to celebrate laughter and raise funds to benefit Limaland Comedy’s goal of creating a Phyllis Diller exhibit in the Lima/Allen County museum. Here is the 2014 Comedy Festival line-up. Visit www.limalandcomedy.com for more details. · Wednesday, July 16th. National touring comedian and Bob & Tom regular Sal DeMilio will bring his Italian-American style to Milano Café. Tickets are $15 and show time is 8:30pm. RSVP at Milano Café as this show is guaranteed to sell out. · Thursday, July 17th. In celebration of Phyllis Diller’s birthday the Lima Holiday Inn will be hosting the Wisegals of Comedy, an all-female comedy showcase starring comedienne Carla Goldbusch as Miss Diller herself! Showtime is 8pm and the show is FREE! · Saturday, July 19th. After t days of comedy it’s YOUR turn. 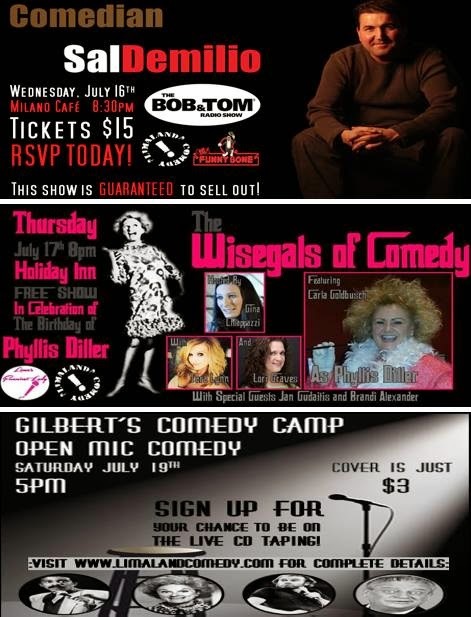 Open mic comedy will be happening at Gilbert’s Music starting at 5pm. Show up and go up! Cover is just $3 and if you’re funny enough you might just make it on Lima’s first ever comedy album! About Limaland Comedy: Limaland Comedy is the area’s only comedy organization. We focus on preserving the legacy of the legendary comedienne Phyllis Diller and developing a local comedy scene with a combination of both national headlining comedians and rising local comics as well. Limaland Comedy also developed the Humor Association; a not-for-profit organization that focuses on improving the quality of life in Lima through laughter and humor.